Are you 8+ or have a child that is, not enough for certification, but can't wait to dive? Well you can by enrolling on a PADI Seal Team Adventure. 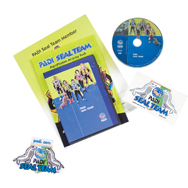 The PADI Seal Team is designed for young divers who are looking for action-packed fun in a pool and to be introduced to the basics of safe diving in a play environment. Here's your chance to do some cool stuff in the pool, meet new friends and have adventures in the underwater world. The best part of the AquaMissions is that they reinforce safe diving and build water confidence while the young divers are having fun. PADI Seals get to sample a wide variety of dives. In addition, this programme provides a structure for young divers to develop skills, learn about the aquatic environment and have a lot of good, clean fun. This is also an excellent introduction to SCUBA diving prior to full Open Water Diver certification. Please read our Important Information. Perhaps you would like to snorkel or even dive with the children - see what they do and wave back? Many adults would like to photograph or film their children whilst diving. Please talk to us first if you wish to do so. We can also supply underwater cameras for you and the young diver to use during their experience! The PADI Seal Team programme consists of 5 different AquaMissions. Each AquaMission is designed to teach the basics of driving, just like the adults - things like buoyancy control, mask skills and regulate recovery. Seal Team members use all the basic SCUBA gear that adults would use. Here at DIVE Rutland, we have a range of smaller sized gear and cylinders specifically for use by our young divers. DVD & Activity book -Check! Log book pages - Check! DIVE Rutland schedule the course over three sessions on Saturdays generally. Each includes a full briefing (16:30) at the Dive Centre and a 2 hours pool session (18:00 - 20:00). Each session also requires a parent/guardian to be present throughout. Become a Master Seal by completing 10 extra AquaMissions ranging from night diving to Underwater photography.